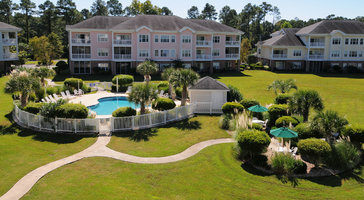 Sprawling along the fairways of Myrtlewood Golf Club, Myrtlewood Villas provides a relaxing family retreat away from the crowds. 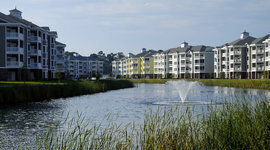 But it’s not just a great Myrtle Beach resort for golfers. Younger kids will love splashing around in the kiddie pool or riding the indoor lazy river. The sandy volleyball court is a great place to make new friends or get together for a family face off. There are two pools to choose from, one indoors, perfect for rainy days and the winter months, and another one outdoors surrounded by palmetto trees. For a little exercise on vacation, head to the fitness center. For a family party or event, there’s a large outdoor event space. All condo rentals come with full kitchens that flow out onto living and dining areas.